Innovative 3D printing leader UNIZ announces the release of a new printing technology called uni-directional peel (UDP) and 53 exciting new products at this year's CES event in Las Vegas on January 9th, 2018. San Diego, US, December 19, 2017	(Newswire.com) - UNIZ took the 3D printing world by storm in 2016 when they debuted the SLASH - A game-changing, high performance, affordable, LCD-SLA 3D Printer at CES. It was a highlight of the show, a revolutionary desktop printer that outperformed competitors in speed and detail, delivering professional level quality at a price that put the power of 3D printing into the hands of consumers. SLASH became the fastest desktop 3D printer ever made, capable of reaching printing speeds of 1000 cc/hr while maintaining incredible detail, with resolutions on the Y and X axis as fine as 2560 x 1600, 339 ppi and 75 μm utilizing ultra-fast LCD Stereolithography (SLA light-curing) technology. When it was released to the public via Kickstarter, they achieved more than 10 times their funding goal and raised over $500,000 dollars in a month. 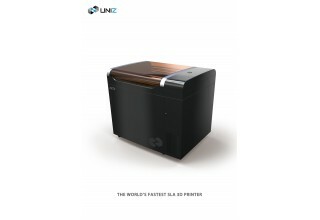 Since then it has been a busy few years for UNIZ and building upon the success of the SLASH, the company today announced the release of 3 exciting new desktop 3D printers, together with 2 new industrial 3D printers, that continue to push the limit of what is possible with 3D printing technology. Once again choosing the Las Vegas event to debut their new suite of products, UNIZ will appear at CES 2018 to demonstrate their newest UDP printing technology and the five incredible new printers: SLASH+, SLASH OL, SLASH PRO, zSLTV15 and zSLTV23. UNIZ built its successful reputation on the speed and detail that their revolutionary SLASH 3D printer delivered and this year’s releases continue that tradition. 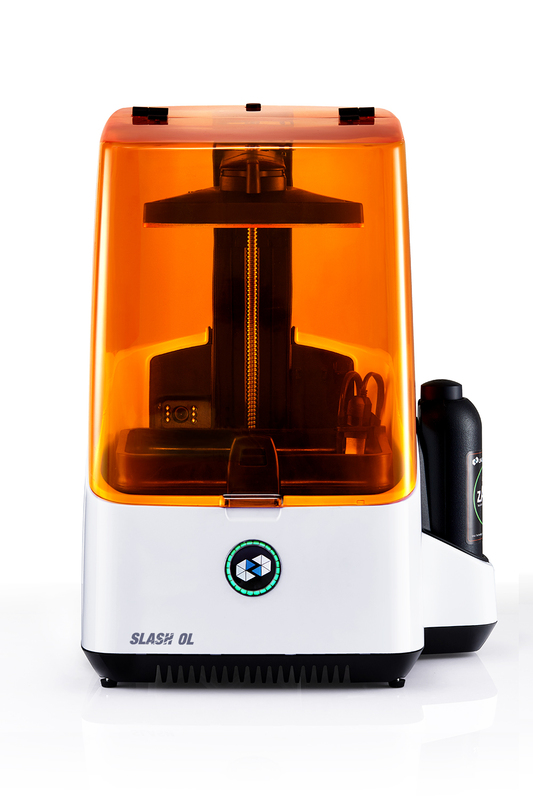 SLASH+– As a follow up to the ground-breaking first generation printer, the SLASH+ LCD SLA 3D printer is an upgraded version for prosumers, hobbyists, educators and artists. 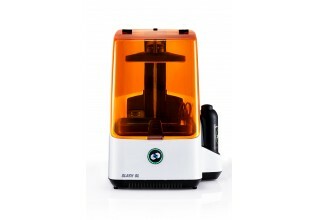 The “plus” model is equipped with uni-directional peel (UDP) technology, which minimizes the peel time of conventional layered SLA process, and achieving an astonishing printing speed of 360mm/hr in z-axis build speed (8300cc/hr build envelope speed), for example, 6 full-arch dental models can be printed in less than 5minutes. This new technology is challenging conventional injection molding in production speed, and this approach to 3D printing makes it easier and faster than ever for professionals and enthusiasts to dream, design and create. SLASH OL – To make UDP-SLA an even more affordable technology for everyday consumer, UNIZ releases the SLASH Online (OL) 3D printer, whose XY resolution is software limited to 150um, and equipped the same UDP technology. This is a perfect solution for consumers in the sub $1000 FDM market, who are not satisfied with the FDM’s poor printing quality, slow speed, and low reliability. The UDP’s 8300cc/hr build envelope speed is 500x faster than any FDM printer, which is a real game-changer in the market. SLASH PRO– The bigger the better. This is the PRO version of SLASH which has doubled z-axis build envelope, with the newly equipped UDP technology, this printer is capable of outputting an full size adult outer-sole in less than 60 mins. This is a perfect solution for professionals who needed the extended build envelope in a desktop setup. 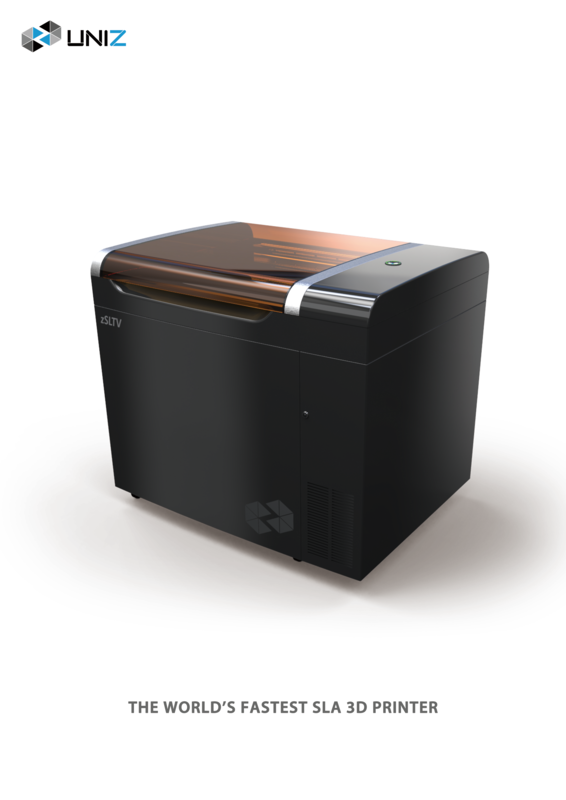 SLTV15 – In addition to the updated SLASH printer, UNIZ is releasing two incredible new 3D printers for professionals and industry applications. The SLTV15 uses the same revolutionary LCD photo curing 3D process as the SLASH and equipped with UDP. This system has 89um XY resolution, 3x build area(330x190mm XY), 8x the build envelope (410mm Z) compared to SLASH, and a blistering fast printing speed of up to 2,800 cc/hr solid output speed and 24000cc/hr build envelope speed. For example, 20 full-arch dental models can be printed in less than 5 mins. SLTV23 – The even bigger brother of SLTV15, equipped with 147um XY resolution, 7x build area (521x293mm XY), 25x build envelope (650mm Z) compared to SLASH. With UDP, this printer is capable of handling a much larger build volume and higher speed than any other 3D printers. 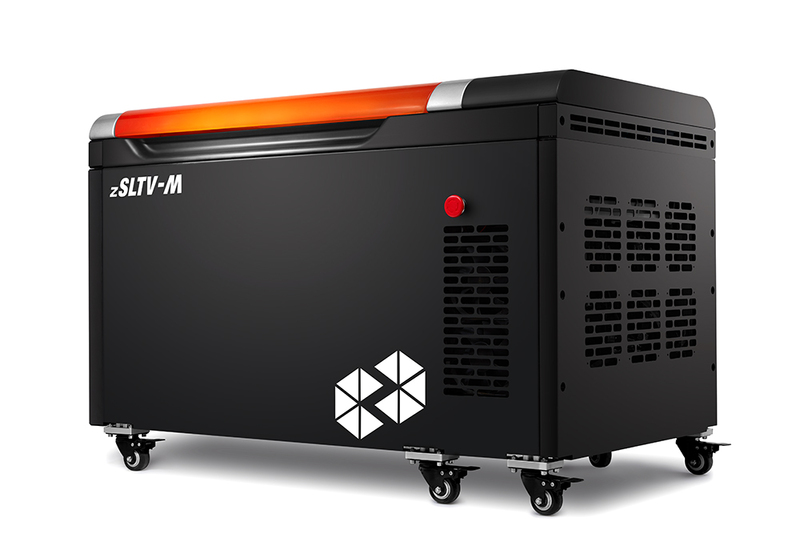 The SLTV23 model further increases printing speed up to 7,000 cc/hr solid and 56000cc/hr envelope speed, making it the fastest SLA 3D printer to date. UNIZ uses proprietary technology to achieve industrial level quality and lightning-fast speeds for prototyping, tooling, manufacturing and more. Their advanced systems delivers results that rival other printers costing hundreds of thousands of dollars more. This performance will offer great benefits to companies looking to accelerate design, R&D, manufacturing and production.